Excerpt from Pharmazeutische Centralhalle für Deutschland, 1895, Vol. 36 Petrolel siehe Vaselin. Snillus D. A. N. 148. Erstarrungspnnht 183. Adhüsions Riemenschmiere Adh$sol. Bestandtheile 436. Adonid Dispensation dena. 79. 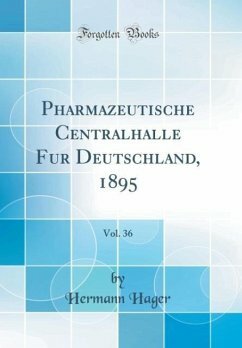 Aerzte, teilung an den Apotheken 515. Aether, Verhalten des reinsten 3. Elektrischwerden dass. 4. Für Narkosen 41. 240. 248. Technische Verwendung 563. Reinigung für analytische Zwecks 589. Anaestheticns König 86. 115. 207. Bromatus D. A. N. 149. Nachweis von Aethyldth er 410. Chloratus, kritische Temperatur dess. 12. Von Aether freier, Bereitung 4. Aethoxyco¿ein 788. Aethylendiamh, Anwendung 4. Aetzalkallen, Herstellung nach Vantin 41. Bestimmung neben Alkalicarhonaten 628. Azur, in Pulverform 526. Agar Glycerin Su positorien 376. Acarlclnnm D. A. 491. Agoniadin, Vorkommen 567. Mm] Formel und Eigenschaften 45. Salben mit A. 247. 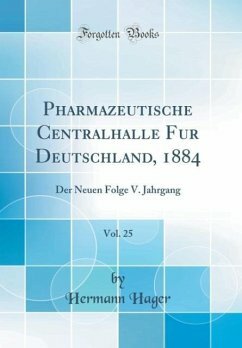 Vorzüge vor Jodoform 275. About the Publisher Forgotten Books publishes hundreds of thousands of rare and classic books. Find more at www.forgottenbooks.com This book is a reproduction of an important historical work. Forgotten Books uses state-of-the-art technology to digitally reconstruct the work, preserving the original format whilst repairing imperfections present in the aged copy. In rare cases, an imperfection in the original, such as a blemish or missing page, may be replicated in our edition. We do, however, repair the vast majority of imperfections successfully; any imperfections that remain are intentionally left to preserve the state of such historical works.